Bill Kemp's spectacular residence in Town and Country is the quintessence of architectural "flow." Continuing his late father’s legacy, Bill Kemp is co-principal of the legendary company and readily admits that he’s been immersed in home building since childhood. 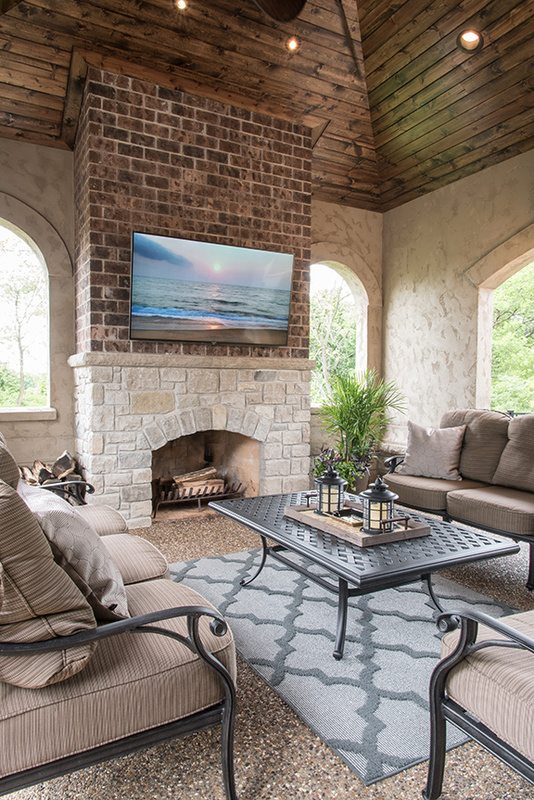 Bill’s specialty is Kemp Signature Homes, the firm’s design/build operation, assisting custom clients to create their finely crafted, one-of-a-kind homes. Working with Robert Srote of Schaub+Srote Architects, Bill defined the parameters: An open layout, designed around a central grand salon and conducive to entertaining. Flowing seamlessly from outside to inside and level to level. As beautiful from the rear as the front. With attention to detail in every aspect. According to the youthful builder/owner, Srote’s design “hit the ball out of the park the first time around,” achieving all of his objectives. Completed in spring of 2016, the five-bedroom story-and-a-half is a magnificent example of Old World French Country styling, encompassing 5,000 square feet on the main levels and 2,200 on the lower entertainment level. Fully consistent from the exterior to the interior, the architectural features visually emphasize the plan’s flow. The elevation is a sophisticated blend of stone and stucco, with bronze trim, simulated slate shingles, arched dormers with copper roofs and a porte-cochère leading to the detached four-car garage. 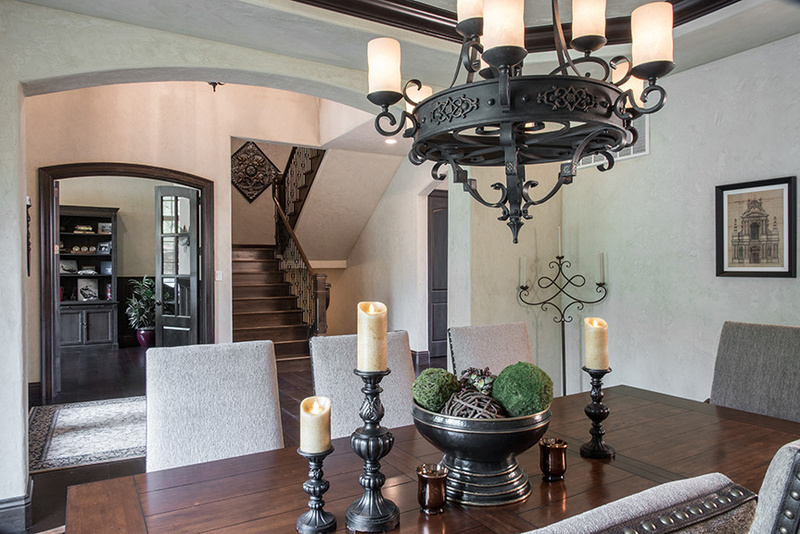 Inside, these classic Old World elements are repeated with Venetian plaster walls, arched openings, full masonry fireplaces, wrought-iron lighting fixtures and dark-stained millwork, distressed beams, and wide-plank distressed oak flooring. The foyer immediately reinforces the theme, with an arched entry door in glass and wrought iron and a groin vault that soars to 16 feet. Although most of the home is more relaxed and rustic, the study and dining room flanking the foyer retain a sense of formality. Rich wainscoting lines the study walls, and the ceiling beams are smooth, rather than distressed. 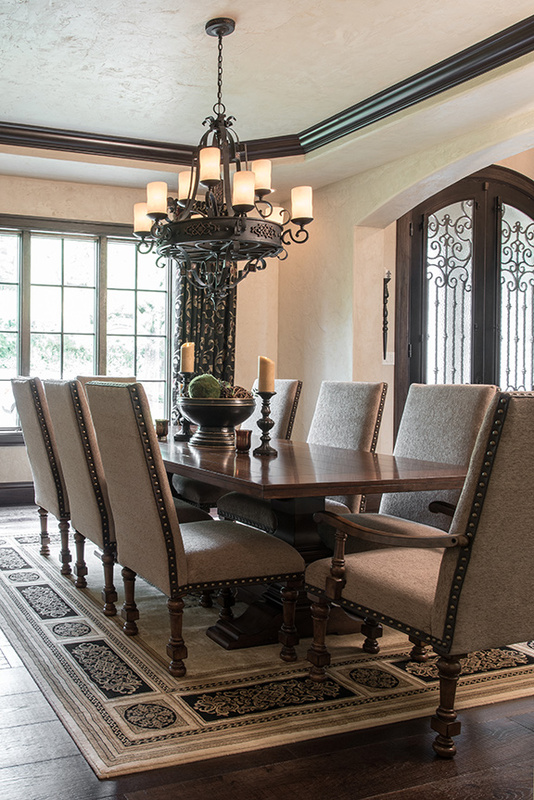 An octagonal tray ceiling with 7-inch molding tops the dining room, and the adjacent butler’s pantry is barrel-arched. 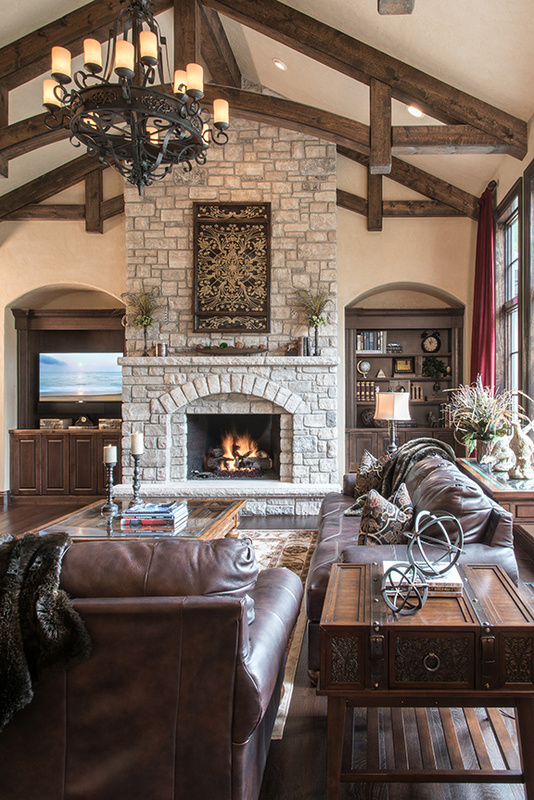 Dominating the main level, the grand salon is a dramatic entertainment space, with 18-foot ceilings, distressed arched beams and a floor-to-ceiling Missouri limestone fireplace. To one side, the ceiling drops to 10 feet, creating a convivial atmosphere for the bar area, which is delineated by a bi-level peninsula and features sueded granite countertops and provincial Beck/Allen cabinetry. Fully open to the grand salon, the kitchen revolves around a huge work island, surfaced in Delicatus Cream granite and inset with a farmhouse sink equipped with gantry faucets. 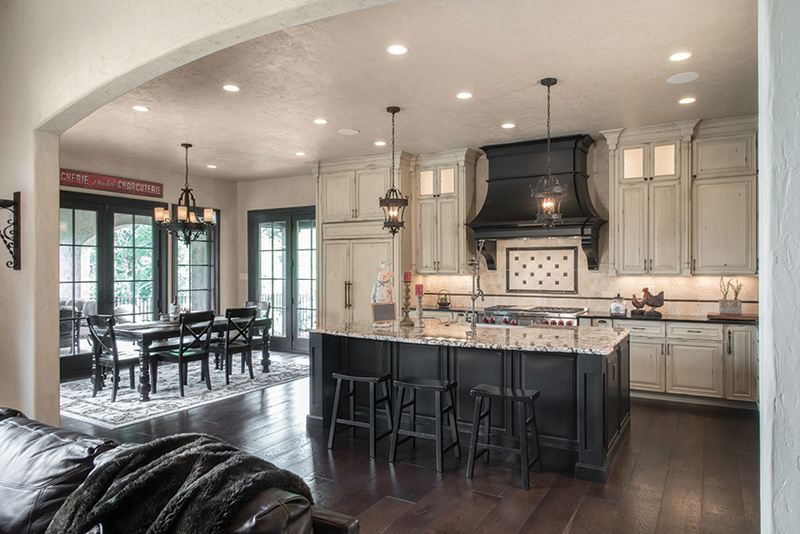 A striking corbeled range hood, black countertops and rubbed bronze hardware provide a handsome contrast to the distressed white cabinetry, and the decorative tile backsplash above the six-burner Wolf range is Kemp’s own design. 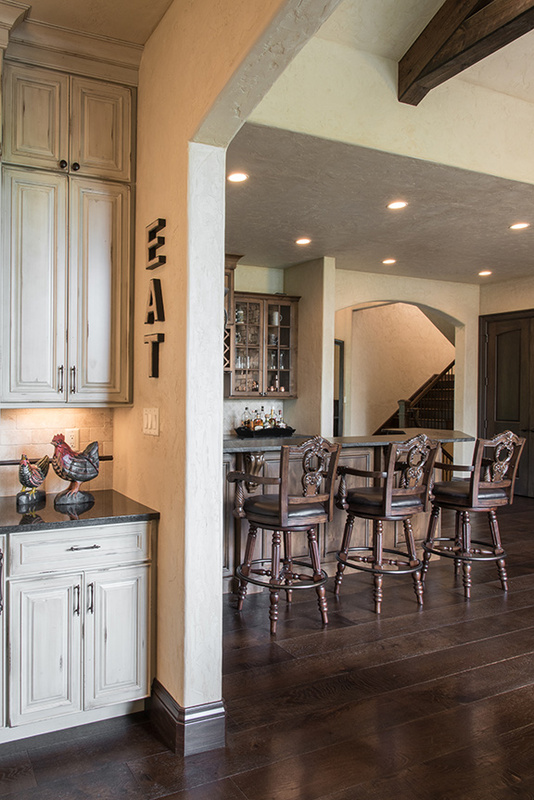 Adjoining the kitchen, the breakfast room has French doors leading to the outdoor living area, and a separate entrance provides convenient access from the kitchen to the stepdown grilling station, which is thoughtfully positioned at the side of the home. Describing the transition from indoors to outdoors, Kemp explains, “I wanted to create an intimate outdoor space, without interrupting the flow of the plan.” Double-vaulted, the open-air living room has a superbly crafted, distressed knotty pine ceiling, exposed aggregate flooring, a full-height brick-and-stone wood-burning fireplace, 65-inch flatscreen TV and a True kegerator for handy beverage service. Wrought-iron railings line the stairway to the expansive lower-level patio, beautifully landscaped by Baxter Gardens and centered by a freeform heated pool, with Pebble Sheen flooring and a cool deck system by Prestige Pools. 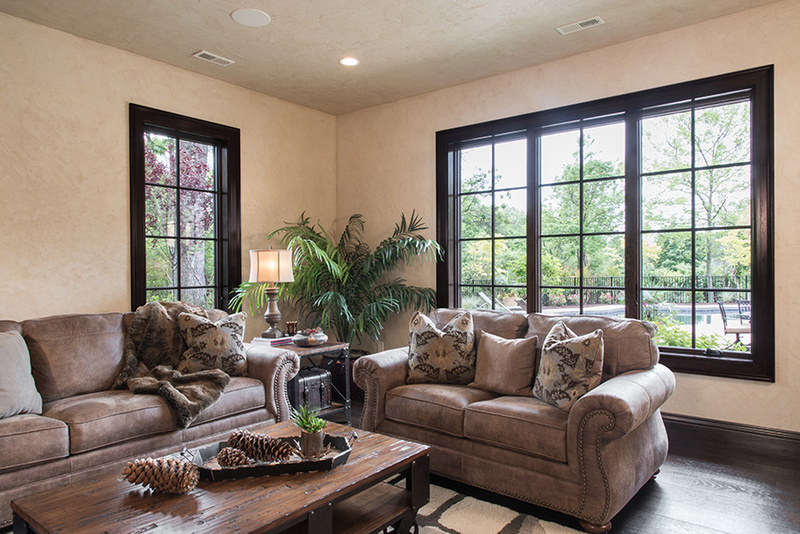 Returning to the home’s main floor, the master retreat occupies nearly a third of this level and is a particular source of pride for the owner/builder. A 14-foot ceiling adds volume to the spacious bedroom, and an innovative “dressing” area, with sink, undercounter refrigerator and coffee bar, separates the bedroom from the huge island closet and bath. Just steps away from that first cup of morning coffee, “This is a feature I suggest to all of my custom clients,” Kemp notes. 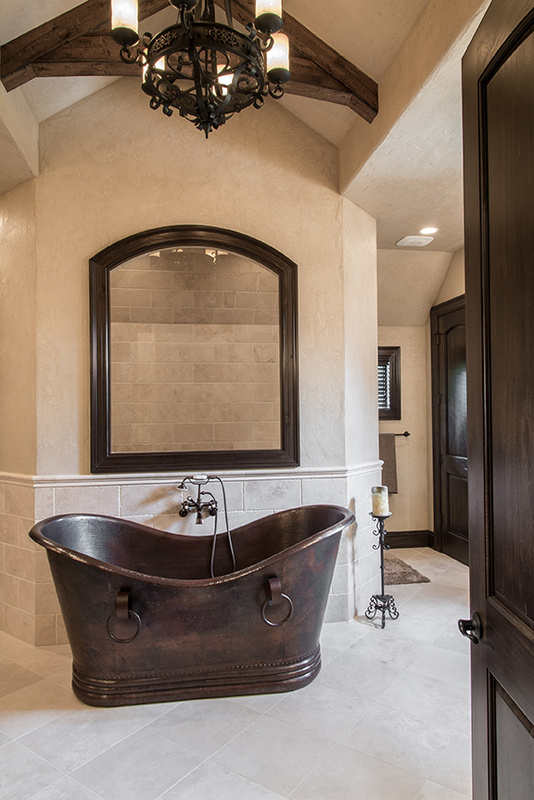 Lavished with travertine and also designed by Kemp, the master bath is literally breathtaking. “There’s a lot of geometry going on in this space,” he says, indicating the peaked ceiling, distressed trusses and freestanding custom copper tub that backs to a room-size shower, with 10-foot seat, six body sprays, and two shower heads. Even more imaginative, controls just outside the enclosure convert it to a steam shower. Further emphasizing the home’s architectural flow, a switchback staircase with radius wall leads to the lower level, where the stepdown landing repeats the curve. Completely devoted to entertaining, this wonderfully open space duplicates the upstairs peninsula bar and showcases Venetian plaster ceilings, a temperature-controlled wine cellar, see-through fireplace and reclaimed shutters bracketing the great room TV. Distressed beams define the billiard area and a theater room with 120-inch screen, and French doors open to the pool deck. A hidden sound room houses the AV components and home automation system, all of which can be controlled by a smartphone. If there were such a thing as an architectural “gene,” it’s evident that Bill Kemp has inherited it. Meticulously crafted, this extraordinary residence is a tribute to his father’s vision – free-flowing, faithful to its styling and a perfect merger of the living environment with its natural surroundings. Under Bill’s leadership, there can be no doubt that these design principles will continue to distinguish Kemp Signature Homes, satisfying yet another generation of St. Louis’ custom home buyers.